Inside: How to use an Advent wreath to keep your heart focused on Jesus all season long. What the candles mean, which candles to light when, and how to develop an Advent tradition your family will cherish. Download the Advent Readings printable! You’ve decorated the Christmas tree, hung the stockings, and unearthed your Christmas decorations–some glittery, some rustic and worn, some homemade–hidden treasures replete with memories of the hands that made them or the first time you found that perfect spot to display them. Through the years, the Advent wreath has become the center of some of my favorite family memories and a way to fix my mind on Jesus in the midst of a busy season. Yes, we have battled sibling rivalry over it (Who gets to light the candles? Who gets to blow them out? ), but we have also found that using an Advent wreath slows the pace and focuses our hearts on the reason for the season. Advent means “coming,” and it is the season in which we prepare to celebrate the birth of Jesus. During Advent, we wait in darkness in hopeful expectation of the birth of Jesus, the Light of the World. In liturgical churches, Advent is the season of the church year right before Christmas. There are four Sundays in Advent: The first Sunday in Advent is always the fourth Sunday before Christmas Day, so it falls between November 27 and December 3. Advent culminates on Christmas Day, when the birth of Christ is celebrated. An Advent wreath provides a way to mark the weeks of Advent and, with the lighting of each new candle, to contemplate all that led up to the birth of Jesus. It usually is made up of four candles–three purple and one pink–often positioned in the shape of a circle or sometimes a line. Many people add a fifth candle, called the Christ candle, which is white and is placed in the center. 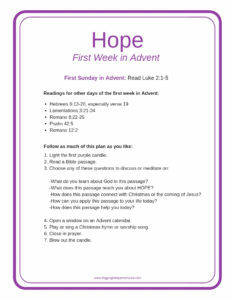 HOPE: On the First Sunday in Advent, we light the first purple candle to celebrate HOPE. This is also called the “Prophet’s Candle,” and it represents the hope we have because Jesus is coming. 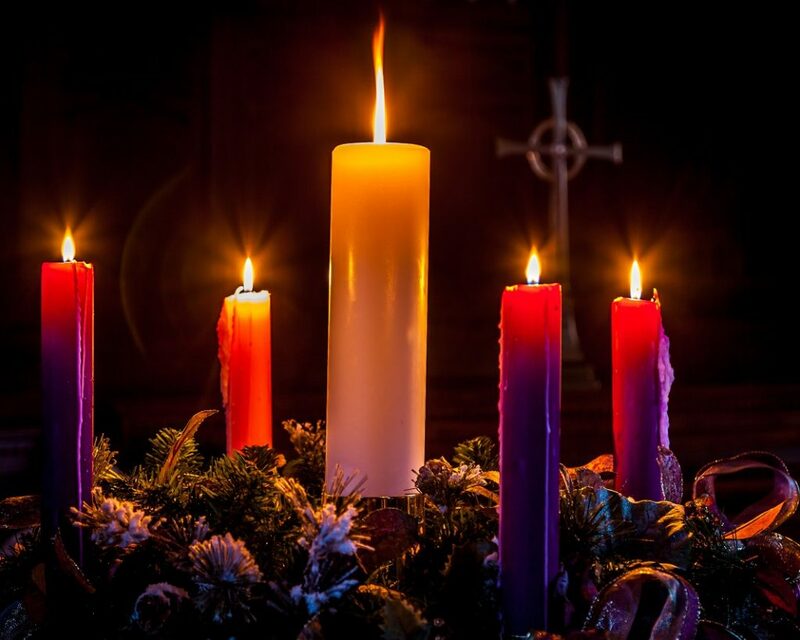 FAITH: The Second Sunday in Advent is marked with the second purple candle, which symbolizes FAITH. This is also called the “Bethlehem Candle,” and with it we remember Mary and Joseph’s journey to Bethlehem. JOY: On the Third Sunday in Advent, we light the pink candle, which represents JOY. This is also called the “Shepherd’s Candle,” and we are reminded of the joy the world experienced when Jesus was born in human flesh. PURITY: If your Advent wreath includes a Christ candle, you light it on Christmas Day. This candle is usually white to symbolize purity. Advent wreaths often including greenery or other decorations. You might like one of these! There are the mechanics of how to use an Advent wreath–the usual way of celebrating with it–and then there is the fine print of how life actually plays out! Let’s take a look at both. You light the first candle, which is purple, on the First Sunday in Advent and every day that week. The second week, you light the first two purple candles on the Second Sunday in Advent and do the same every day that week. On the Third Sunday in Advent, you light the first two purple candles plus the pink “joy” candle, and you light those same three candles every day that week. On the Fourth Sunday in Advent, you light the first two purple candles, the pink candle, and the final purple candle (four candles total), and you light all four candles every day that week. On Christmas Day, you light all of those candles plus the Christ candle, if your wreath has one. 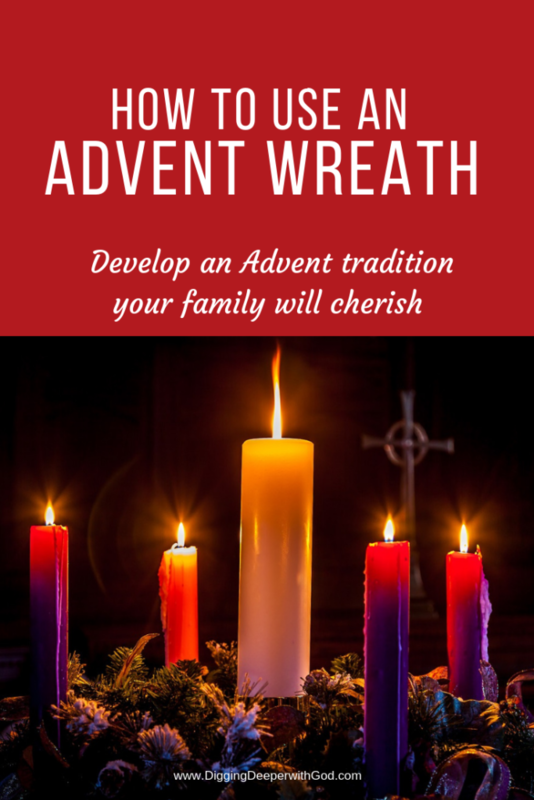 You will develop your own traditions for how to use an Advent wreath. While the candles are lit, many people read a scripture passage or a devotion intended for each day of Advent. I have created Advent Readings for you: You’ll find scripture readings chosen for each theme (hope, faith, joy, peace) and questions to ponder as you gaze into the light of the Advent candles. Download the Advent Readings and focus your heart on Jesus this Christmas season! You might also enjoy reading an Advent devotional book during your time around the Advent wreath. It pains me that we are past the age of these creative books! The first book below includes an Advent calendar in the back, and the second one includes ornaments that children can color. 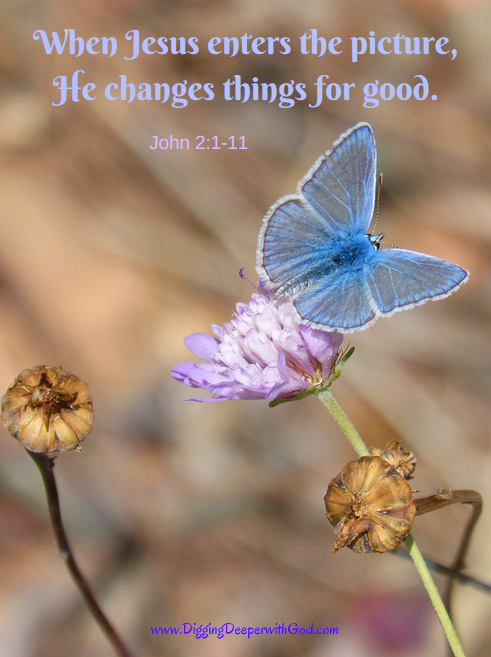 Remember that you can grab your own devotional from DiggingDeeperwithGod.com, with Advent Readings I have collected to correspond to each week’s theme–hope, faith, joy, and peace! When you light the Advent wreath, it is also a very good time to let children open the next window in an Advent calendar! This has been a favorite tradition for us. Find the Advent calendar that would work best for your family! You might even sing a Christmas hymn or worship song. Did you know that any radio station that streams its music can be played on an Amazon Echo or similar device? In an ideal world, your family would enthusiastically gather around, no one would argue over who gets to light the candles or open the Advent calendar today, and you would have purposeful discussion while gazing on the beauty of the Advent wreath. The rest of the day, you would bask in the wondrous glow of this meaningful time spent together. Well, this is not Little House on the Prairie. We are living in different times with busier schedules and testier attitudes! Give yourself and your family boatloads of grace! You might only get to light the Advent wreath with your whole family one time a week. That’s OK: Make the most of it! We have lit the candles, said “Thank you, Jesus,” and promptly blown out the candles as the kids donned their back packs and ran out the door to get to school on time! No prayer, no devotion, nothing more than a moment! But for that brief, important moment, we fixed our eyes on Jesus! If you are lighting the Advent wreath with more than one child, I highly recommend making a schedule for who gets to light the candles, read the Bible passage or devotion, open the Advent calendar, and blow out the candles. This seriously will save you tons of grief! For heaven’s sake, tie back long hair, and don’t leave the candles unattended! Notice that LED candles are available (see below). If you are single or your spouse travels, the time spent in personal devotion with the Advent wreath lit can become a particularly special time for you with the Lord. Light a candle, open your Bible, and treasure the time spent with God. 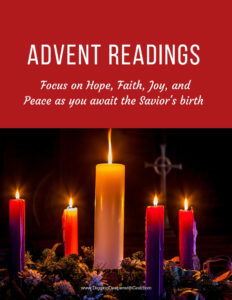 Be sure to download Advent Readings, my gift to you this Christmas season! Use it as a guide as you light the candles and ponder the coming of Emmanuel, God with us. If having an open flame is an issue in your setting, try a flameless version! Finally, there are sets that include a white Christ candle, or you can buy one separately. I use the tall, skinny candles for the outer ring and a pillar candle for the Christ candle. Blessings to you as you prepare to celebrate Jesus’ birth this Advent season!